COLCHESTER, United Kingdom — With an eclectic and award-winning catalogue of classical music—much of it consisting of orchestral, choral and chamber music—UK-based Chandos Records is renowned for its natural sound quality and prides itself on capturing superior audio with first-class balance. Founded in 1979 by Brian Couzens, the independent label is today run by his son Ralph, who knows that sound is only as good as the production facilities, and his quest for a state-of-the-art digital mixing console to complete the equation led him recently to a 32-fader HARMAN Studer Vista 5. But the path that led Chandos to Studer was due to the extensive recording work they undertake with the BBC Philharmonic and Symphony Orchestras, the BBC Concert Orchestra and BBC National Orchestra of Wales. “We were aware that all their resident BBC facilities were equipped with various Vista consoles,” Couzens noted. He and assistant engineer Jonathan Cooper attended a Studer Broadcast Academy day in Potters Bar and Studer volunteered a demo rig for evaluation. Chandos Records fired it up at Watford Colosseum and Couzens was convinced then and there. The 32-fader desk consists of 20 channel strips, optimised for input channel operation, and 12 additional versatile strips for operating output and input channels. By using the standard Vistonics screen, up to 52 outputs are under immediate control. A total of up to 240 channels can be accessed from the desk and laid out in any order, with the Vistonics™ system giving instant control over all related channel functions. The DSP power and I/O are configured to customer requirements. Typically Chandos will be recording orchestral ensembles in excess of 100 musicians—plus chorus—which places a heavy requirement on the I/O count. 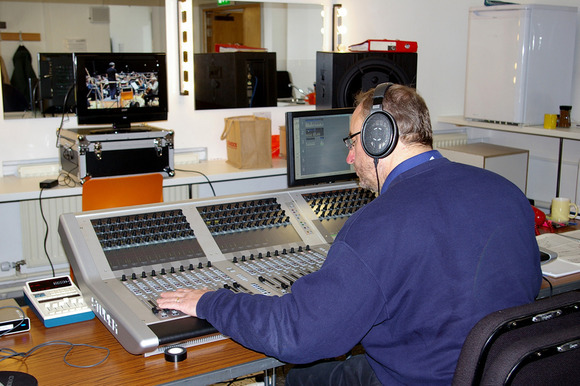 One such instance was at Watford Colosseum where the new console was pressed into service to record the complete orchestral works of Witold Lutoslawski by the 100-piece BBC Symphony Orchestra, conducted by Edward Gardner—for release later this year. “We have 40 mic preamps and eight line outputs in the Stagebox and record via MADI to our Sadie LRX2. Sound quality is so important and the Studer A/D converters [the most important stage in the process] in the Stagebox are also fantastic,” Couzens continued.